Let’s talk about covers. Let’s also answer some of the common questions people have about them and some helpful tips that can make your life a little easier. Do You Need A Cover? What is the Best Jet Ski Cover? – The best jet ski cover is going to be ones made for your exact model jet ski. You can find covers often sold at your local dealer but you can also find them online by searching for your model. For example, You can get a Sea-Doo GTI Cover Here. A cover is probably the best thing you can get for your watercraft (besides insurance). 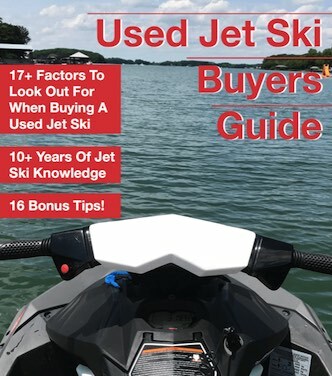 A cover will help protect your jet ski from the Sun and other things like birds. It doesn’t matter what a salesman or your buddy says; you need to get a cover. Above all else, you need to have that cover on the watercraft when you’re not riding it for optimal protection. Why Don’t Covers Last Anymore? The thing about covers is that they will last anywhere from 3 to 5 years if you’re lucky. But this is a good thing. When you think about it, you’ll want the thing that protects your expensive watercraft to get damaged and not the watercraft itself. It may seem confusing that covers wear out so quick. The reason is that they’re under a lot of abuse even if you’re gentle with them. What the cover does is protect your watercraft from the elements. The biggest things it protects your machine from is the Sun and water which do the most damage to the cover. There’s an old saying: “The worst thing for your boat is Sun and Water“. If your cover looks bad then imagine how your watercraft would have looked if you didn’t use a cover? One reason I think people think their covers doesn’t last that long is that the Jet Ski is usually the furthest thing from people’s minds until they want to use it. You may use the machine a couple of times a year, and after 3 years it may feel like you just bought a cover not too long ago. Why Are Covers So Expensive? It’s a fact that covers do go up in price every year just like most things. Since you’ll need to get a cover every 3 to 5 years, it might be worth it to look at affordable covers. You can get some affordable covers online which is great news! But these covers are not the same thing you would get at most dealerships. 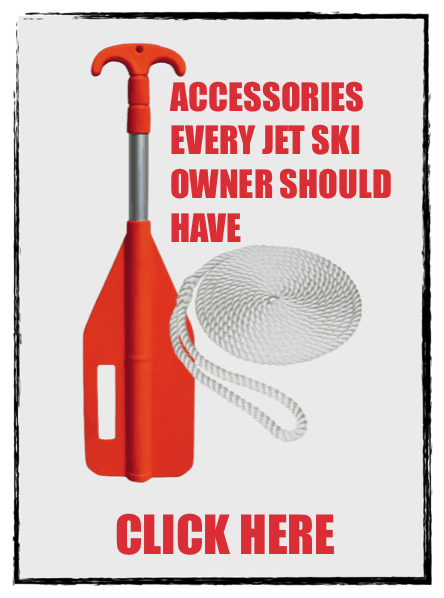 Here is a Cover I’ve used on My Jet Ski before and works well. The covers made by the manufacturer are really good covers. Most of these covers will have a thicker material that holds up better, and some even go as far as having cotton padding to protect the hoods and such. Probably the biggest perk of getting a cover that is made for your watercraft is that it’s usually easier to put on. Most Sea-Doo covers will have a cotton padding; this tells you that this is the front of the cover. You drape the cover over and align up the handle bars. Put the nose on next and come around the rear for the complete covering. The manufacture’s cover will fit like a glove and don’t require any complicated ratcheting. Another big perk is that most of these covers are well thought out that they have zippers that allow you to get to the gas fill and many other compartments of the watercraft. I’ve even seen some covers come with a carrying bag that is a part of it. The cheaper covers or the “universal fit” covers are like baggy jeans, sure you have pants on, but you need a belt to make it work. These covers are usually made of thinner materials and don’t last as long, well some of the modern ones are lasting a long time nowadays. I use a universal cover for my Sea-Doo Spark, and it works fine. These covers tend to have a ratchet or clips that you have to use to tighten down to the watercraft. Also, these covers work really well for trailers as some have the underside clips that keep the cover on when you tow it. Tow With My Cover On? The counter argument is that people leave the covers on to keep the watercraft from getting dirty or rocks hitting them. This is a very valid argument. I have found a middle ground when it comes to this problem. To get the best of both worlds I put the covers on like normal and use a ratchet strap like this one here across the middle of the covers. This way if the cover comes loose I won’t lose them, and I can fix it right away. It may look funny to see, but it solves all the problems. Before you even consider washing your cover, you need to be honest with yourself. If the cover feels brittle, has holes, or super moldy, then it is time for a new cover. If you try to wash a cover that is falling apart, you’re only going to be doing more damage to it. If you need to get mold off of your jet ski cover, then the best thing to use is a mildew spray like this one here. To keep the mold from coming back is almost impossible. The Jet Ski is exposed to moisture all the time – that is just the nature of the beast. But you can slow down the growth of mold by spraying mold spray often on the inside of the cover. Also, allow the watercraft to dry out before you put the cover on is the biggest thing you can do. Use a Shammy or Towel to dry off the seats and the watercraft before you put the cover on and the mold problem won’t be much of a problem anymore. Another option is to use Simple Green and a scrub brush to clean the covers really well. I have heard of some people putting covers in a front-loading washing machine and putting it on the gentle cycle with light detergent. I’m not a fan of this as this could do more damage than good if you’re not careful. Why Do We Even Need Covers? Why can’t they just make the watercraft hold up better to the sun? My car does just fine, and I don’t have to cover it! Your watercraft is made of Fiberglass (unless it’s a Spark). Fiberglass is very different than the painted metal that your car has. The reason why watercraft are made of fiberglass is that it’s light but also strong and most importantly the more affordable option compared to similar materials. If it were affordable, they would make watercraft out of carbon fiber, but it’s too expensive to do so. Just like your skin fiberglass is porous, and also like your skin, it dries out quickly too. You put lotion on, and a jet ski needs wax also to protect it from the Sun. Waxing a jet ski is not fun and can be time-consuming, so we instead put covers on them. The cover also keeps rainwater and bird poop off of it which can be damaging as they could contain acids in them. When you get a Jet Ski cover especially one from the manufacturer, it can be hard to put on. This is very common. You want a tight cover if you plan on towing it behind your car, but just like shoes, the cover needs to be broken in. Make sure to put the handle bars on first, then the nose, and lastly the rear. If you try to put the cover on rear first, then it’s going to feel impossible. It’s always handlebars, then the nose, and then rear. Any other way and you’ll be yelling and cussing the cover. If it’s a brand new cover I like to lay it out in the Sun for a couple of hours before I put it on so that it stretches out a bit. This can make putting the cover on soo much easier. Plus, the cover will get easier to put on over time just like how shoes get easier to put on over time. Where Can You Get Covers? 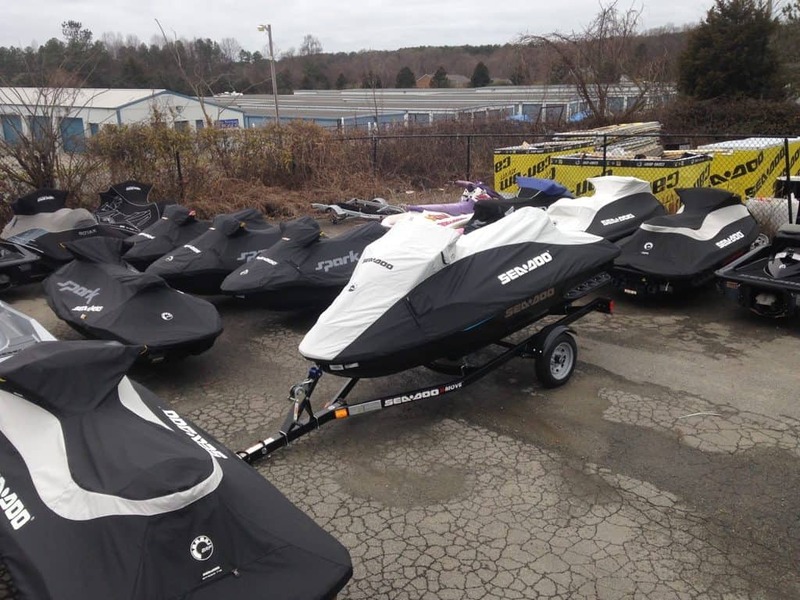 You can get covers for your watercraft at your local dealer. If you don’t feel like going to your dealer or want to see other options, then you can buy Jet Ski Covers Online. Any tips for putting the cover on while PWC is on the lift? This has been a frustrating experience! If its a lift that goes up in the air many of them have a way to rotate it so it’s easier to get to. If its a drive-up lift I usually put the rear on first and then handlebars and then nose. If the cover is new it might need to be broken in but I have run into new covers way too tight and had to go to an upholstery shop to loosen up the bungee. It might be worth checking out your local upholstery shop to loosen the bungee on the cover so its easier to put on.